In 1874 Modest Mussorgsky composed his famous Pictures at an Exhibition, based on ten drawings and watercolors produced by his recently deceased friend, the architect and artist Victor Hartmann. Most of the works that inspired the composer are lost, either yet undiscovered or, sadly, destroyed by time and neglect. This gallery contains images of several of Hartmann's pictures, some of which inspired Mussorgsky's music, and some not. I have also included (or will include) the odd image, not drawn by Hartmann, that nevertheless seems to me to evoke a particular passage of the music. As I have already described the music and general background of each movement in my review of Barry Douglas' performance of Pictures at an Exhibition, I will not reiterate my comments on this page, but will instead provide some of the background material that I have been able to ferret out concerning the pictures themselves. This picture shows one of Hartmann's costume designs for a revival of Glinka's opera Russlan and Ludmilla. The evil wizard Chernomor wears a turban crowned by a bat, and bears a staff on which is perched an owl. The opera was performed with Hartmann's designs in 1871 at the Maryinsky theatre in St Petersburg. The menacing figure of Chernomor provides distant echoes of The Gnome, Mussorgsky's first "picture" in the suite, which was based on a design for a toy nutcracker. Hartmann's original design has long since vanished. Hartmann drew 17 costume and set designs for the ballet Trilby, four of which are extant. 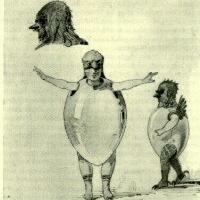 This is the sketch that inspired Mussorgsky's Ballet of the Unhatched Chicks. Trilby was first performed at the Bolshoi in 1871, with choreography by Marius Petipa and music by Julius Gerber, both celebrities in their day. The plot was loosely based on a short story by the French author Charles Nodier titled "Trilby, or the Elf of the Argyle", published in 1822 (there is no relation to DuMaurier's ballet Trilby, which appeared in 1895). Petipa moved the setting from Scotland to Switzerland, and made other substantive changes as well. The title was changed to "Trilby, the Demon of the Hearth". The ballet featured children from the Russian Imperial Ballet School dressed variously as birds, butterflies and, as in this sketch, chicks still in their eggs. Hartmann spent a month in Poland sketching and painting, especially around the town of Sandomir. Mussorgsky based the tenth movement of his suite on two pencil drawings in his own collection. The drawings showed "a rich Jew wearing a fur hat: Sandomir" and "a poor Sandomir Jew". This was the one movement in the suite that the composer did not title, and for a time it was known merely as "two Polish Jews". Hartmann apparently had made another drawing titled Samuel Goldenburg and Schmuyle. One commentator speculates the composer's friend and patron Vladimir Stassov had mistaken this drawing as the inspiration for the movement, and applied the name to it after Mussorgsky's death. To my knowledge, none of these drawings have survived. 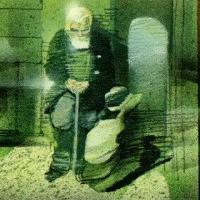 The image shown here is a watercolor of still another poor Sandomir Jew by Hartmann. 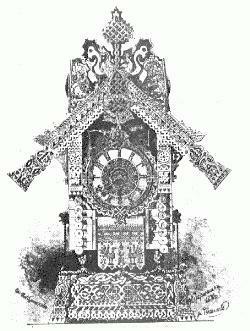 The top image is Hartmann's design for an elaborate bronze clock in the form of The Hut on Fowl's Legs, the abode of the witch Baba Yaga. along rows of plaster of Paris Greek gods and goddesses, a witch, Baba Yaga, was running, her red braids streaming out behind her. A big fuzzy hat was pulled down over her eyes, her feet were wrapped in cloth, bony arms stuck out of the sleeves of her robe, a sparse beard protruded from her chin, her horrible eyes gleamed maliciously on her painted face, tusks stuck out of her half-opened mouth." The bottom image is Alexander Alexeief's drawing of Baba Yaga's hut, which I scanned from Russian Fairy Tales by Aleksandr Afanas'ev, originally published in 1945. Alexief's sketch is much more dynamic and less ornate than Hartmann's, and for this reason comes far more readily to my mind when I listen to the music. Hartmann had graduated from the Academy of Fine Arts with honors, and was thus allowed four years abroad at government expense as a sort of post-graduate education. Hartmann spent three of those years in France, and here made the drawings and paintings that were to become the inspiration for three of Mussorgsky's musical sketches: Tuileries, Limoges, and The Catacombs, represented here. 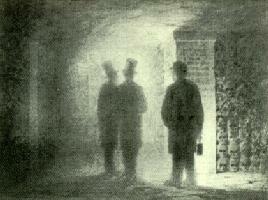 This is a self portrait of the author in the Roman catacombs beneath the streets of Paris. The exhibition catalogue reads: "Interior of Paris catacombs with figures of Hartmann, the architect Kenel, and the guide holding a lamp". 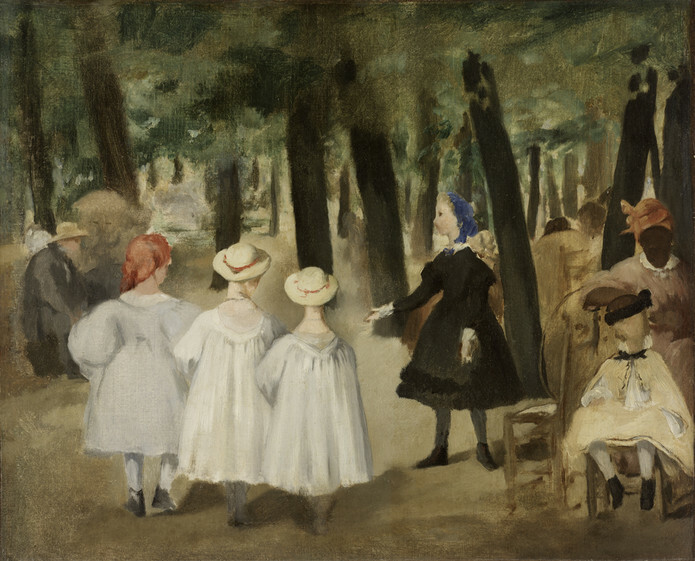 Although Hartmann's drawing is not available, this painting by Edouard Manet, finished in 1862, also shows children in the gardens at Tuileries. On April 4, 1866 the Tsar Alexander II narrowly escaped an assassination attempt in the city of Kiev. A competition was ordained for the design of a great gate to commemorate what was referred to as "the event of April 4, 1866" - the Imperial Censor forbidding language any more particular than this. While the Tsar was happy to have escaped with his life, he apparently was a bit uneasy at any explicit public acknowledgments of the fact. Perhaps it was this ambivalence that led to the eventual cancellation of the project; or it may have been a simple paucity of funds. 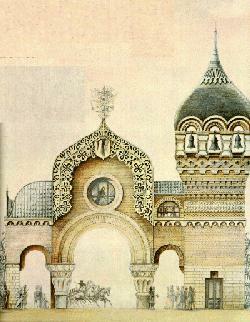 Victor Hartmann's design for The Great Gate of Kiev caused a sensation, and the architect himself felt it was the finest work he had yet done. The cancellation of the project must have come as a blow. My primary source for the information presented on this page is Alfred Frankenstein's excellent scholarly article "Victor Hartmann and Modeste Mussorgsky", published in the July 1939 issue of the Musical Quarterly. The images of Chernomor and of Hartmann's clock design were scanned from a photocopy of this article that I obtained through the Interlibrary Loan program. 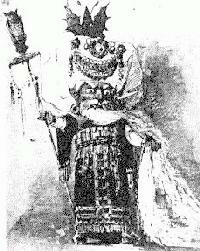 Images of the Trilby costume design, the poor Sandomir Jew, the Catacombs, and the Great Gate of Kiev were all adapted from larger images found on Birmingham Southern College's informational web page on Mussorgsky. Note: This link is currently not working. Alexander Alexeief's drawing of Baba Yaga's hut was obtained from Russian Fairy Tales by Aleksandr Afanas'ev, originally published in 1945, and republished in 1973 by Random House, Inc. The image of Manet's Children in the Tuileries Gardens was found on the website of the Rhode Island School of Design Museum.